Google unveiled Android 4.2 Jelly Bean today, which is really just a smaller update compared to the move from Android 4.0 Ice Cream Sandwich to Android 4.1 Jelly Bean (yes, the name of the OS remains the same). So what can you expect? 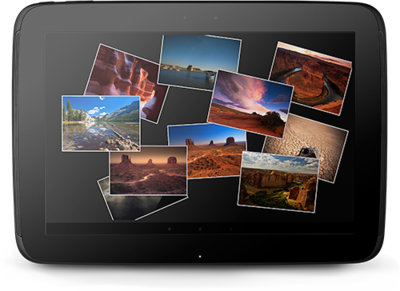 Well, it will be available for the Nexus 4, the Nexus 7 and the Nexus 10. It offers a few new features that are worth mentioning, let’s take a look. Android users have long been able to take advantage of a different form of typing that allows you to swipe from one letter to another to create a word. Apps such as Swype have offered fantastic support in the past and it even comes pre-loaded on several devices. 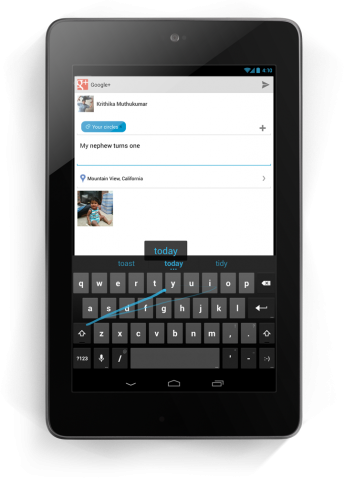 Now, Google is making that form of typing a default option in Android 4.2. It calls the feature “Gesture Typing” and it works just like Swype. “You don’t have to worry about spaces because they’re added automatically for you,” Google explained. Android’s dictionary has been updated with more words than ever before and it even allows you to type with your voice with improved text-to-speech functionality. At the beach and want to capture the moment entirely? 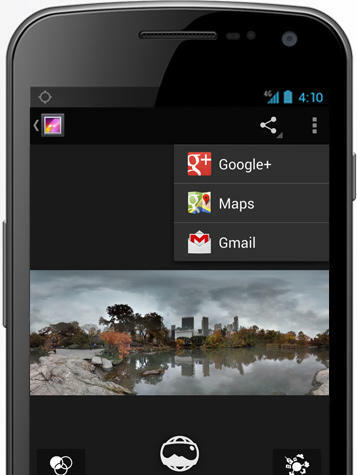 Photo Sphere allows you to do just that. Instead of snapping a large panoramic photo, you can use Photo Sphere to take a full 360-degree video of exactly where you are. You can view it on your phone when you’re finished, share it to friends or post it to Google+ so people can check it out on a computer. It’s even possible to add them to Google Maps. There are a few examples of Photo Sphere already available and you can check them out here. This is an amazing new feature and one we’ve seen added to Barnes & Noble’s Nook HD tablet. 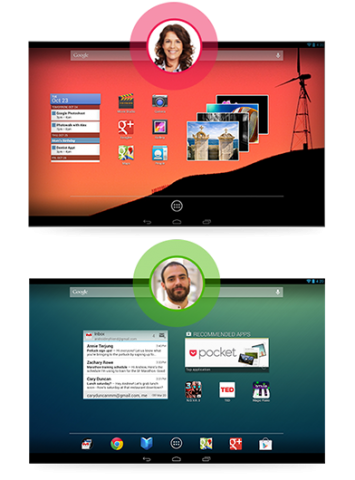 Basically, your whole family can share a tablet and you can create different home screens for different users. That means you can buy a tablet for your kids to share and your son can have his games, his email and his books on one account and your daughter can have a completely different experience on her own account. This is a tiny, but worthwhile little feature. Daydream allows you to use your lock screen for showing off photos or other information. You can view the latest headlines from the news sources in your Google Currents account, for example, or see a whole gallery of photos pop up. It’s not entirely ground breaking, but it’s certainly better than just seeing the weather or other small tidbits of the lock screens that are currently available for most devices. Samsung, to its credit, has already been offering this sort of capability with its Galaxy S III and Galaxy Note II devices. Google also updated Google Now and Google Search in Android 4.2, which is amazing because we already loved the support in Android 4.1. Google Now will tell you the weather “before you start the day,” or when the next train is coming right when you’re standing in the station, Google explained. It also lets you see “popular photo spots nearby, track packages easily” and find out information about movies playing nearby. Google Search has been updated, too, and Google says it’s “easier than ever” to find results for any query you toss at it. Sure, this wasn’t a major update to Android, but it’s a noteworthy one. 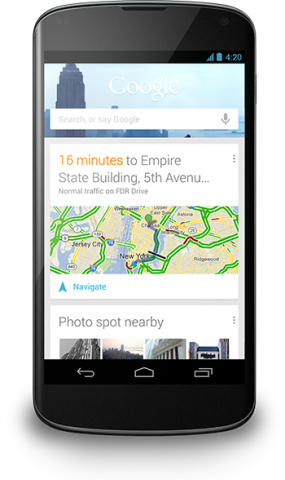 Google expanded in plenty of areas that make its mobile platform more powerful than ever. It’s a bit of a bummer the Nexus 4 only offers support for HSPA networks, instead of LTE, so we’ll probably just wait until Android 4.2 trickles its way down to more smartphones before we can put it through its full paces on a smartphone.